The reason this doctrine is so important at the present hour is illustrated by men in history, and some at present such as Brian McLaren, who has written: "For starters, if God wants to forgive us, why doesn't He just do it? How does punishing an innocent person make things better? That just sounds like just one more injustice in the cosmic equation. It sounds like divine child abuse." Men like this fail to recognize that God is both holy and love, and to deny this aspect (justice) of God's character is to deny the reality of His rights and demands. These two facets of God's character must BOTH be held firmly (love and justice), and to seek to remove either from their essential place which we hold dearly, would leave us with an incomplete, even an untrue gospel. When John the Baptizer said "Behold the Lamb of God which taketh away the sin of the world," he illustrated that the world's sin needed to be addressed in judgment. 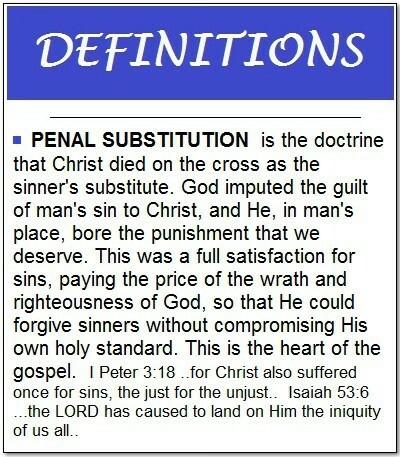 I Peter 3:18 is a case in point to show the necessity that sin be judged, while also showing substitution: "Christ also hath suffered once for sins, the just for the unjust that He might bring us to God." Isaiah 53:6 says "...the Lord hath has caused to fall upon Him, the iniquity of us all..." The Hebrew of Isaiah here is very detailed, "to fall on Him" is the phraseology. Often our translations say "laid on Him" or something like that, but the rendering "caused to fall on Him" is what is there in the text, and this tells us the nature of what Christ bore on the cross. It was caused to fall upon Him. It is the holiness of God that demands that sin be judged, and the law demands a life be taken. Otherwise God would cease to be holy and just. It is the love of God that provides a perfect substitute to bear that penalty. And the only One who could do so, and DID do so, was without blemish Himself. Faultless and righteous, the Lord Jesus Christ voluntarily paid what justice demanded. I John 4:10 says: "In this is love, not that we loved God, but that He loved us and sent His Son to be the propitiation for our sins." A propitiation is a satisfaction, from a worthy substitute. Christ paid the price and is risen from the dead, showing heaven's satisfaction in a finished work, sufficient, not to be repeated. *much of the first paragraph is borrowed from a Master's Seminary article on penal substitution. Note: by "substitution" we do not mean that a saviorless man would be judged in the way Christ was judged and thereby pay his own debt, and it is merely Christ doing so by substitution, the doctrine in view here is the sacrificial substitution of Christ, the just for the unjust. Like the Ram put in the place of Isaac. The penalty to pay could not be paid by man, only by the God-man.